So, guess what? 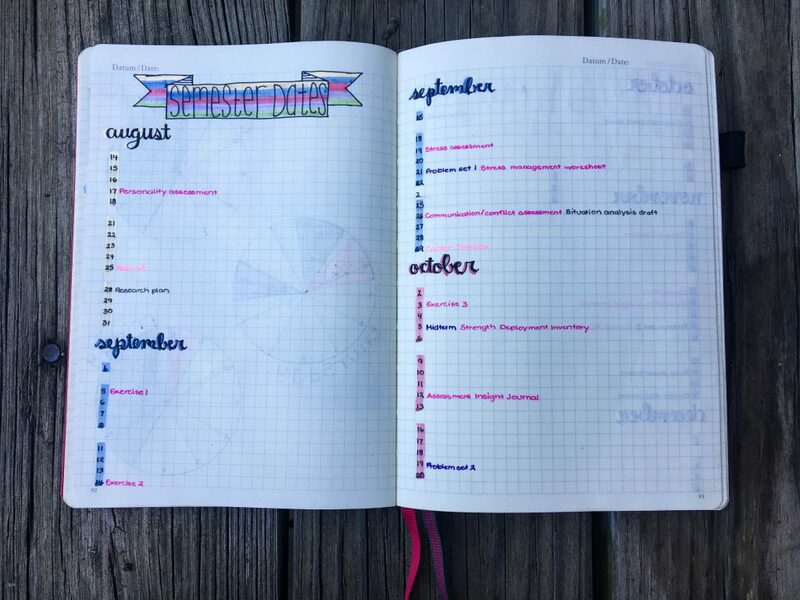 I changed my bullet journal layout again. 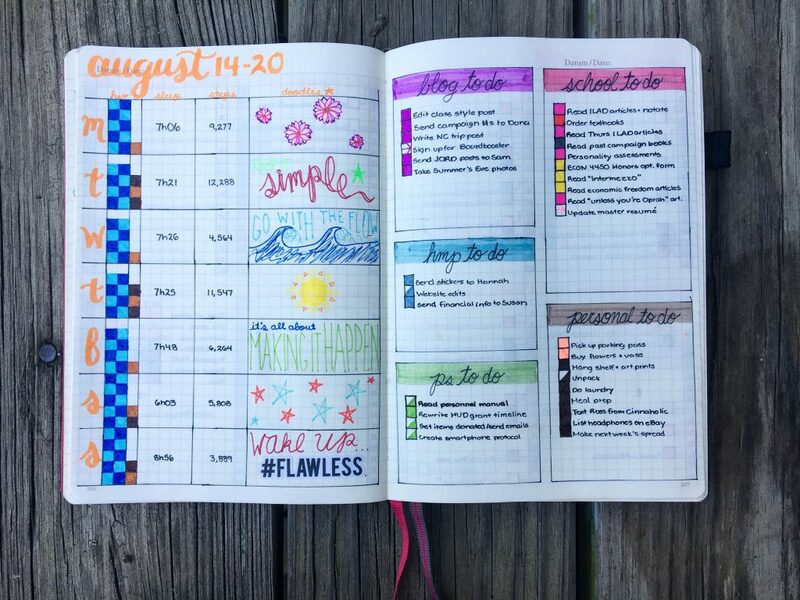 Don’t get me wrong, the old layout was great, but when I got my new Day Designer and started using that planner as well, I needed a slightly different layout that allowed me to really use the bullet journal to fill in the cracks that my Day Designer doesn’t quite cover. I got a lot of the layout ideas from Pinterest, and have tried to adapt them to what I’m looking for. First up are some semester layout pages. I made one that’s got the basic outline of my weekly schedule on it (which isn’t actually complete yet, as I’m still waiting on the times for a few of my extracurriculars). 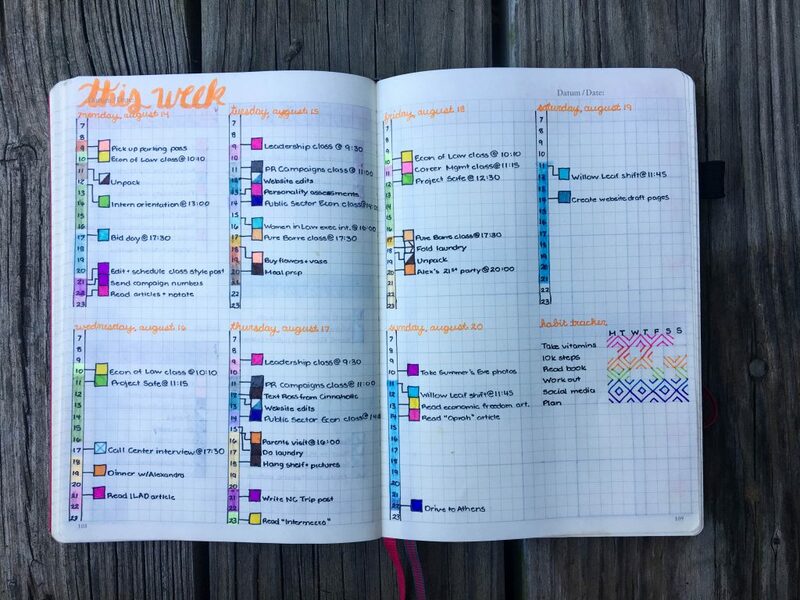 This is nice as a quick overview of how my time is being spent during the week and it’s a slightly-cuter-than-usual way to record my weekly schedule. I also made a timeline of all my semester due dates. Normally I have way more assignments during the semester, but since a lot of my classes are capstone/senior-level classes, they’re more focused on tests and final projects than on smaller assignments. It’s still a nice way to get a bird’s eye view of the semester. 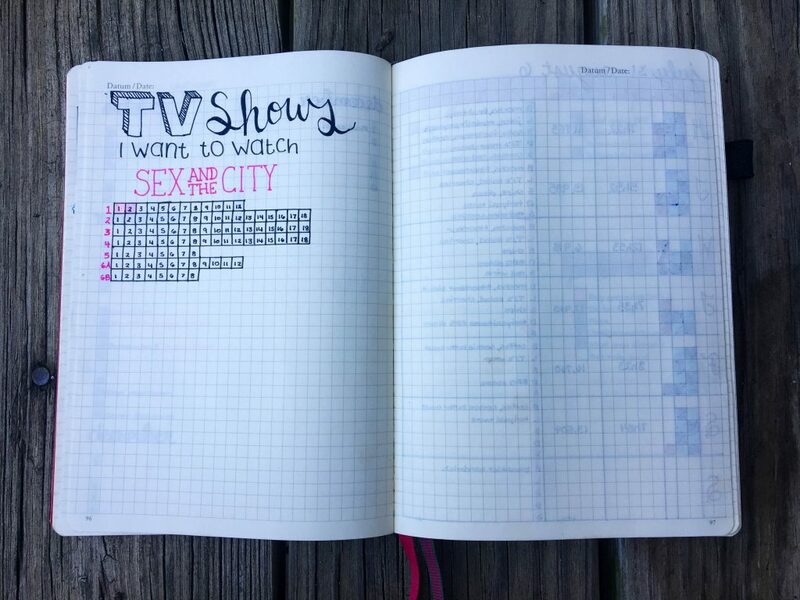 This one is so completely unrelated to school, but I decided to make a page in my bullet journal to track TV shows I’m watching. I’m so painfully task-oriented that I hate doing things that don’t allow me to check something off of a to-do list, so this is my way of getting around that. Now I get to color in a box every time I watch an episode, which puts my Type A heart at ease. 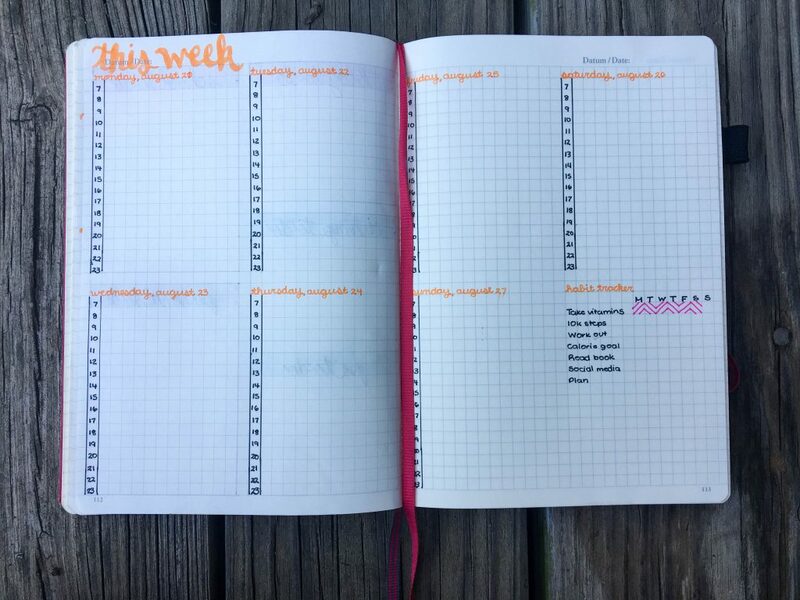 I got rid of the monthly layout, and I actually now have two weekly layouts instead. The first one is a tracker and overall to-do list. Here, I keep track of water consumption, coffee, sleep, and steps, and then I have a nice little box for doodles. It’s an odd thing to put in a planner, but it’s actually a really fun way to capture my mood for the day. 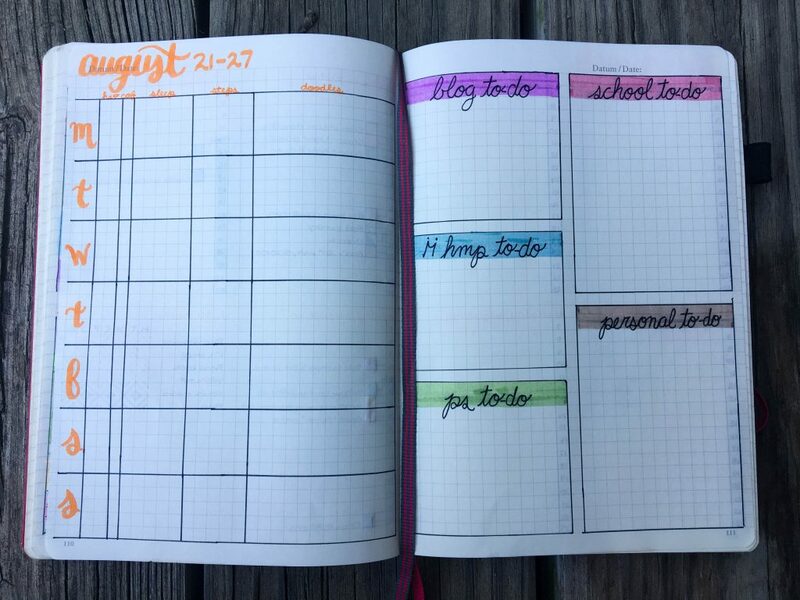 On the right-hand page, I keep my to-do’s sorted out by the general task area they belong to, whether it be blog, internship, job, school, or “personal” (which is really just a catch-all category). 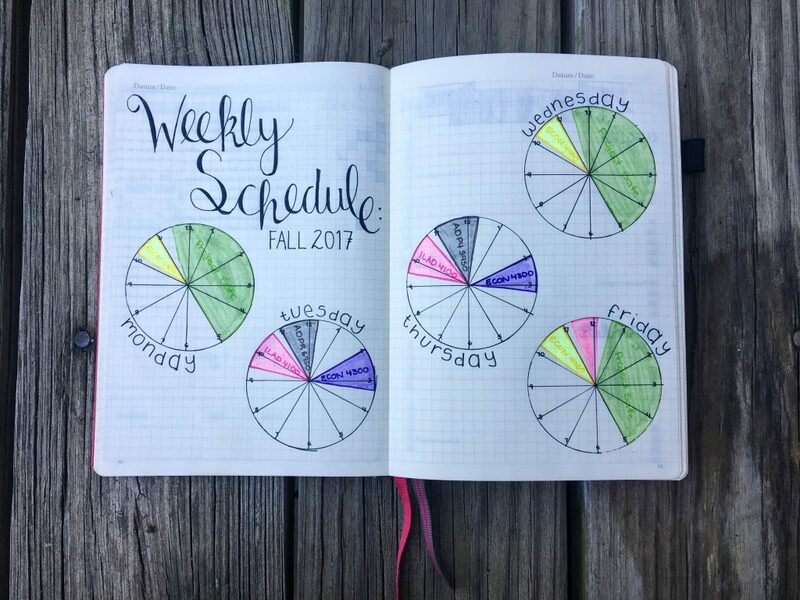 The second weekly layout is a timeline that allows me to assign specific tasks and appointments to certain blocks of time during the day. 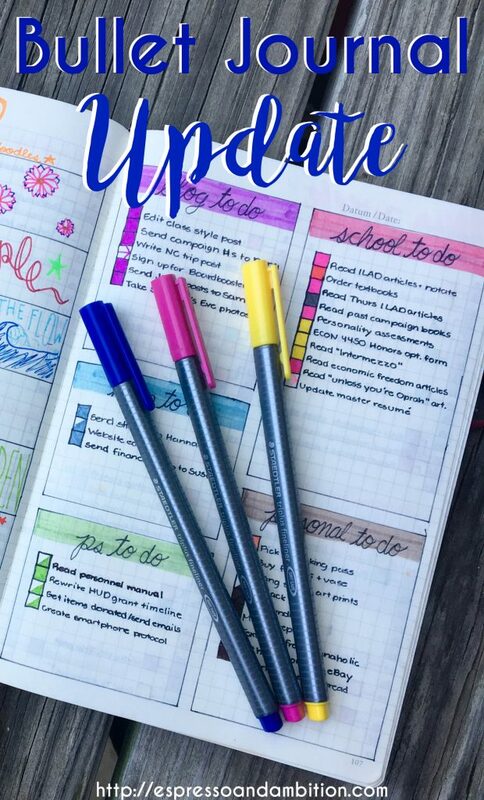 I also put my habit tracker on this page – I have fewer habits there than I used to on some of my older spreads, but I decided to pare down my list of habits to those that I really want to focus on – although I may add more as the semester goes on. 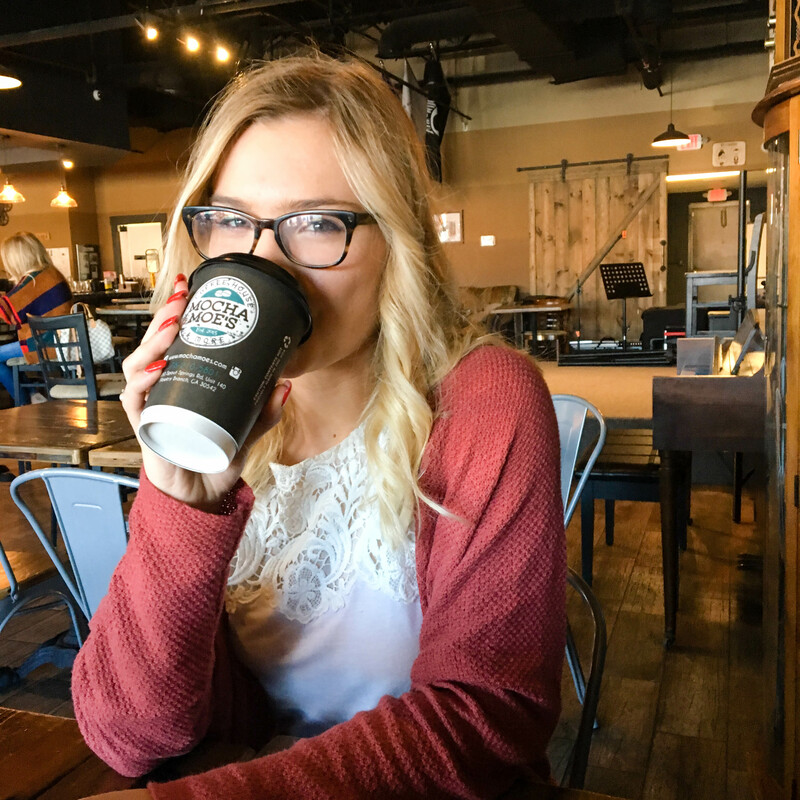 I’m including pictures of what a finished week and a fresh week look like – it’s so crazy to see how different they look! I think that’s it for this update… currently taking bets on whether or not I’ll change the layout again and have to provide yet another update before the end of 2017.